We will discuss about DDL and logon triggers in a later session. In this video, we will learn about DML triggers. In general, a trigger is a special kind of stored procedure that automatically executes when an event occurs in the database server. DML stands for Data Manipulation Language. INSERT, UPDATE, and DELETE statements are DML statements. DML triggers are fired, when ever data is modified using INSERT, UPDATE, and DELETE events. DML triggers can be again classified into 2 types. After triggers, as the name says, fires after the triggering action. The INSERT, UPDATE, and DELETE statements, causes an after trigger to fire after the respective statements complete execution. On ther hand, as the name says, INSTEAD of triggers, fires instead of the triggering action. The INSERT, UPDATE, and DELETE statements, can cause an INSTEAD OF trigger to fire INSTEAD OF the respective statement execution. When ever, a new Employee is added, we want to capture the ID and the date and time, the new employee is added in tblEmployeeAudit table. The easiest way to achieve this, is by having an AFTER TRIGGER for INSERT event. In the trigger, we are getting the id from inserted table. So, what is this inserted table? INSERTED table, is a special table used by DML triggers. When you add a new row into tblEmployee table, a copy of the row will also be made into inserted table, which only a trigger can access. You cannot access this table outside the context of the trigger. The structure of the inserted table will be identical to the structure of tblEmployee table. So, now if we execute the following INSERT statement on tblEmployee. Immediately, after inserting the row into tblEmployee table, the trigger gets fired (executed automatically), and a row into tblEmployeeAudit, is also inserted. Along, the same lines, let us now capture audit information, when a row is deleted from the table, tblEmployee. The only difference here is that, we are specifying, the triggering event as DELETE and retrieving the deleted row ID from DELETED table. DELETED table, is a special table used by DML triggers. When you delete a row from tblEmployee table, a copy of the deleted row will be made available in DELETED table, which only a trigger can access. Just like INSERTED table, DELETED table cannot be accessed, outside the context of the trigger and, the structure of the DELETED table will be identical to the structure of tblEmployee table. In the next session, we will talk about AFTER trigger for UPDATE event. I will execute that trigger that time this error will be occur. And sorry for bad English for my Chilean, regards. you need to somehow store the logged in user ,and pass it as a parameter. @Prasad and @Kunal, The newly created table columns are not matching with the inserting command that you are using inside the trigger. 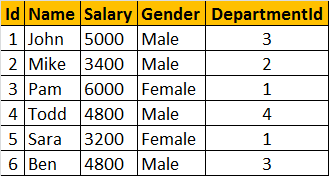 And if you want to insert the text then you must declare the column datatype as varchar in new table irrespective of the trigger(created) table if you want to store all the information(message) in one column. Is There Possible we create Single Trigger for Insert, Update And Delete ?